There is no mistaking the Olympia Collection for anything but a bold study on contemporary design. Sleek lines extend with the push of a button on taking you from a seated to prone position with amazing ease, whether you are on the dual reclining sofa, love seat, or chair. The raisin tone top grain leather covers the seats, top part of the arms and front part of the backs, while leather match covers those areas beyond your initial reach. White contrast stitching further accents the design. The collection is also available in several different configurations to choose from, to complete your sectional living room arrangement. 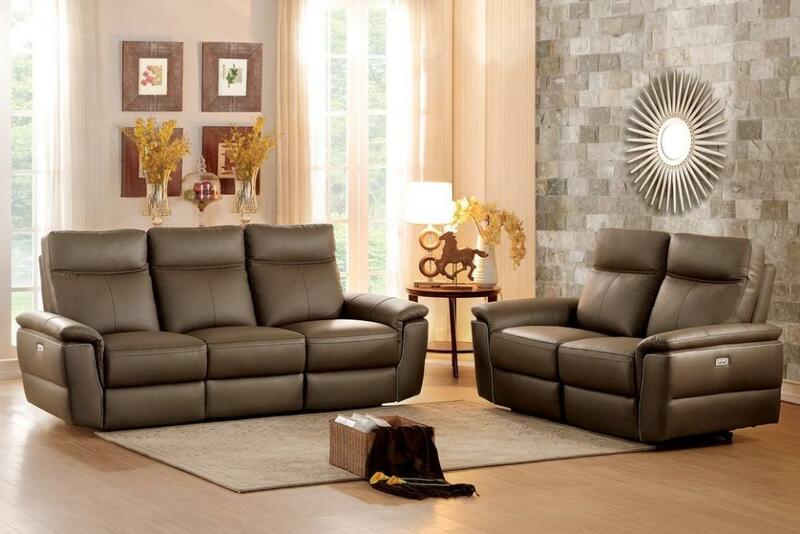 FEATURES: Raisin Color ~ Contemporary Style ~ Dual Power Reclining Ends ~ USB Port ~ Stitching Accents ~ Front 100% Top Grain Leather / Back Leather Match Cover Accents.